The development of flexible electronic devices, worn over our skin as clothing, could catapult us into a sci-fi wonderland of wearable and interactive technology. However, materials required to realize such devices for everyday use would need to be, not only lightweight and flexible to ensure user comfort and safety - but also produced using methods that are practical, safe and cost effective. Researchers, led by Professor Ken-ichi Saitow, from HU’s Natural Science Center for Research and Development, believe they have found a way to realize such materials for a mass market. Their production method, carried out at room temperature, is not only extraordinarily simple but the material that results performs far better than those previously produced using methods requiring temperatures in excess of 120ºC. By simply brushing a glass surface using a velvet cloth, the researchers were able to manipulate the surface structure so that its molecules aligned in a single direction. 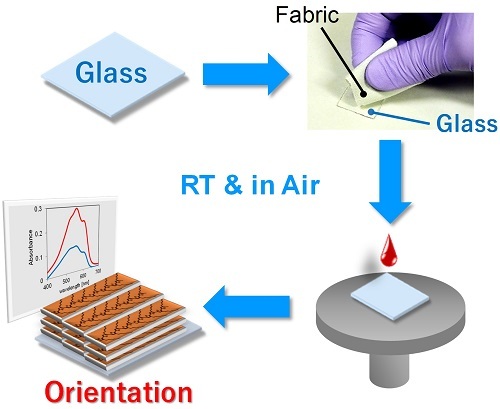 When a conductive polymer, a cellulose material, was then applied to the glass surface, using a method known as spin coating, an extremely lightweight and transparent film was produced whose own molecules aligned to the same regular pattern due to binding of the cellulose to glass. The resultant uni-directionality of molecules within the clear film meant that electricity could flow through its regular structure without obstruction – allowing for electronic efficiency with minimal heat gain – very important for devices intended to cover your skin! It’s simple low-temperature production, and extreme thinness, makes it even more outstanding and could see a whole swath of smart clothing in your wardrobe very soon. Schematic diagram of a new method, soft friction transfer method, conducted at room temperature and in air to prepare a oriented polymer film. Title: Uniaxial orientation of P3HT film prepared by soft friction transfer method.